Nothing of man lasts forever. In the end, all crumbles to dust. But some things sure do give us haunting beauty during the course of their long toil to entropy. BuzzFeed has compiled photos of 33 places build by man throughout the world, left to ruin but gorgeous to behold. There is quite a poignancy in these images. I thought the one on the left - of the remains of the bobsled track from the 1984 Winter Olympics in Sarajevo (at the time in the now-disbanded country of Yugoslavia) - was especially moving. That was one of the most well-remembered Olympiads of the past half-century. 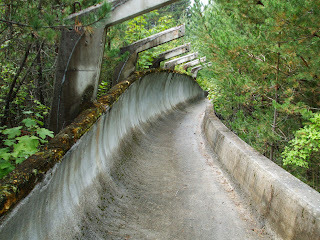 And now, look at what remains A long concrete chute, left to decay amid the foliage. A few years after those games, Yugoslavia disintegrated into ethnic warfare and religious strife which cost the lives of countless thousands. "All is vanity", as the Preacher at Jerusalem cried. There are plenty more photos at the link above. Some are of structures that will leave you wondering how the heck they were built at all and others... well, you'll be bugging your eyes out trying to figure out what the heck it is you're looking at (try staring at the one of the House of the Bulgarian Communist Party without getting a migraine). Tip o' the hat to Danny de Gracia for a great find! To me, most of these places arent beautiful. Abandoned places always look sad to me. Dont get me wrong, I LOVE to explore abandoned places too. There are a few places this article failed to list. One is Walt disney world's River Country attraction. I believe it was opened back in 1977 or 78. It was supposed to resemble a backwoods country watering hole. It was closed due to a new government regulation regarding where and how River country may get its water. They decided that it was less expensive and problematic to shut down River Country than follow the government regulations. People have sneaked into River country many years after the fact, and got some great pics and video which can be seen on the internet. Another one is the concrete ship, SS Sapona which was used in the 1977 nazi zombie movie, Shock Waves.